The mood in the Komets' locker room after their 4-1 victory Friday over the Greenville Swamp Rabbits was an odd one. They may have turned in what looked like a statistically dominant performance – they had a 42-15 lead in shots, including 21-0 in the second period – but they weren't happy. They felt they were sluggish in the first period, needing goaltender Michael Houser to bail them out. That's true. And in the third, they kept turning the puck over and that allowed Greenville to hang around longer than was probably necessary. Also true. "You could tell we had a week off. We just weren’t sharp. 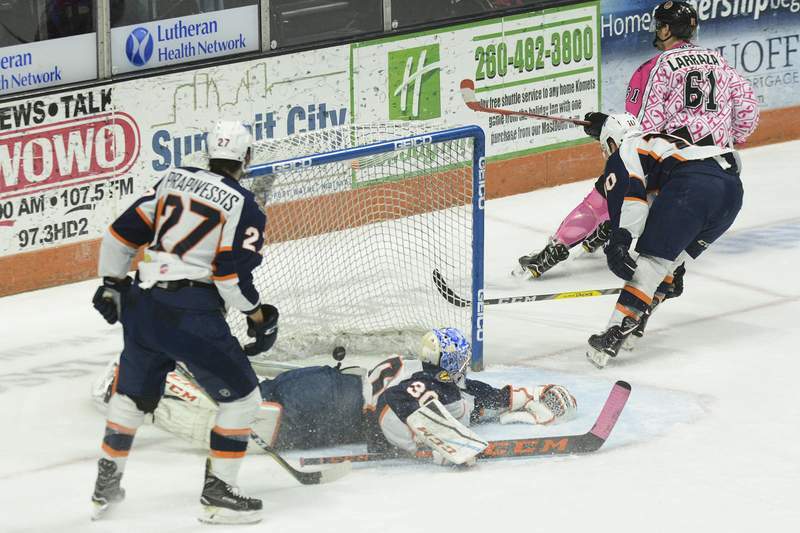 Our timing was off," Komets coach Gary Graham said. "We had a lot of guys turning pucks over. It was very frustrating to see how we played in the first 13 minutes of the third period." Remember, these teams meet again 7:30 p.m. Saturday and they will be donning pink again to benefit the Vera Bradley Foundation, so you can bid on the jerseys or buy autographed pucks to support the fight against breast cancer.